where people can return to a clean, healthy and responsible way of living guided by the wisdom of the earth, the body and the creative spirit. renovated and converted into 8 self-catering cottages and a large event room. The surrounding meadows have been transformed into beautiful gardens and hidden amongst the roses, jasmine and bignonia is a sparkling swimming pool. come simply to rest and revitalize or to attend the artistic, educational and cultural projects offered here. These many activities share a common focus: facilitating alternative living in terms of the self, the environment and the community. 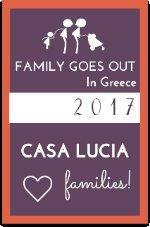 Casa Lucia is in the centre of the island making it an ideal starting point for exploring the whole of Corfu. It is run by Val Osborne-Androutsopoulou, and her daughter Zoë Valerie. The buildings, some dating from Venetian times, were lovingly restored and converted by Dennis Androutsopoulos. Regular classes take place in various body-mind practices such as t'ai chi, yoga, qigong and 'Ensoma'. Qualified practitioners come to give massages, beauty treatments, and alternative therapies.